Speak Up About the Circulator! 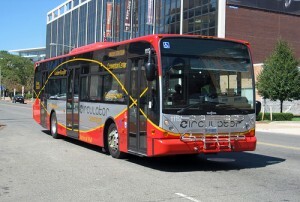 - What should change about the Circulator over the next 5-10 years? - What should stay the same? One of my favorite things about D.C. is how it’s possible to function here without a car. 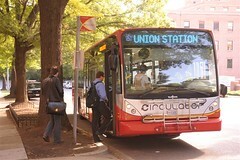 When I lived in Georgetown, the Circulator was my conveyance of choice for getting to work– or a metro station. It’s nice to be asked for input regarding a service I enjoy and appreciate. Circulator’s New Route? East of the Anacostia River. DDOT is currently conducting a comprehensive study to guide the expansion of the Circulator system over the next five to ten years. That includes an ongoing collaboration with neighborhoods east of the Anacostia River to determine the best route for a new line in this location. This planning effort will be completed this fall. DDOT anticipates the route with service east of the Anacostia River to garner much demand and has already directed First Transit, which operates the DC Circulator, to purchase buses for the new line in preparation for starting service next year.